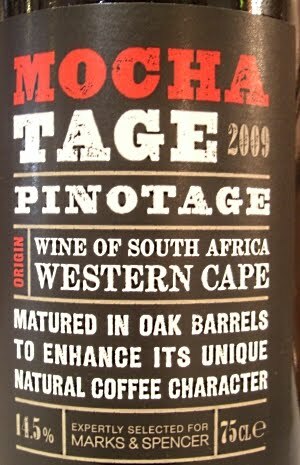 "on the pinotage bandwagon once again and the reason why is because it makes terrific wine. Proof is in two recent Wines of the Week – Kidnapper Cliffs Hawkes Bay Pinotage 2009 two weeks ago, and this week Karikari Estate Northland Pinotage 2008. Don't like Pinotage? Wonder what I'm on about. Well, have you ever tasted Pinotage? Or if so, when did you last actually taste one without any preconceived notions in your mind? Because if you have preconceived notions you are living in the past? It's 2011, not 1967." Read the rest of Sue's report on her always interesting Wine of the Week blog here. Seems every month a new coffee ’n’ chocolate Pinotage is added to the pack. When supermarkets get their own label version then you know it is entering the mainstream. 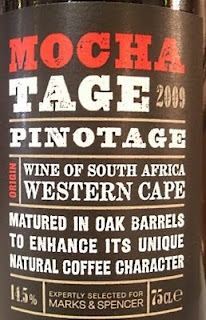 Mochatage is Marks & Spencer’s take on the category and the front label leaves no room for doubt about its taste and how that is achieved. And it’s pretty good, not overpowering although distinctly coffee-ish, but there’s also some silky ripe berry fruit flavours underneath. I could face a second glass of this and I think it’ll please shoppers pining for the loss of Diemersfontein’s original from Waitrose’s shelves. 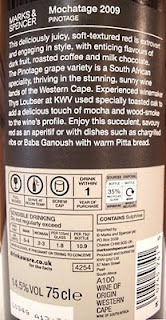 The wine is made by Thys Loubser at KWV: is it their Café Culture under a different label? Anyway, £6.99 at M&S in a screwcap.